Shiraz E-Medical Journal - Do we Need to Screen Uremic Patients for Toxoplasmosis before Kidney Transplantation? Do we Need to Screen Uremic Patients for Toxoplasmosis before Kidney Transplantation? To Cite: Seifollah Beladi Mousavi S, Faramarzi M. Do we Need to Screen Uremic Patients for Toxoplasmosis before Kidney Transplantation?, Shiraz E-Med J. 2013 ; 14(4):e18283. doi: 10.17795/semj18283. Background: Toxoplasmosis can cause serious complications among persons with weakened immune systems and therefore in solid organ transplant patients. Objectives: The aim of the study was to evaluate the value of screening for toxoplasma antibody titers in the donors and recipients candidate for renal transplantation in Ahvaz city, Iran. Materials and Methods: In a cross sectional study from March 2010 to April 2012, we evaluated donors and recipients who referred to our kidney transplant center in Naft Hospital, Ahwaz, Iran.Routine pre transplante laboratory testes including liver function and toxoplasma IgG and IgM antibody were performed. Results: A total of 52 people, 30 donors (20 male and 10 Female) and 22 recipients (12 male and 10 female) were included in the study. Mean age of donors and recipients were 30.32 ± 6.75 years and 45.09 ± 10.57 years respectively. The marker of HBV and HCV infection were negative in 100% of recipients and donors. Toxoplasma IgG antibody was positive in 45.45 percent of recipients (N = 10) and 63.33 percent of donors (N = 19) but there was no statistically significant difference between them (P = 0 .057) and between males and females (P = 0.74). Toxoplasma IgM antibody was negative in 100 percent of recipients (N = 22) and 93.33 percent of donors (N = 28). Conclusions: According to seropositivity for toxoplasma infection in about half of donors and recipients candidate for kidney transplantation, we should perform screening for this infection to avoid kidney donation from seropositive donor to seronegative recipient. Toxoplasmosis is a parasitic infection caused by an intracellular protozoan parasite called Toxoplasma gondii. The parasite infects a very large variety of species especially warm-blooded animals including humans, but the primary host is the felid (cat) family. This Infection in humans is mainly acquired by ingestion of food or water which is contaminated with oocytes shed by cats or by eating undercooked or raw meat containing tissue cysts. Transmission from mother to fetus is another significant source of human infections in some countries (1, 2). Toxoplasmosis is a worldwide infectious disease; its spread in different parts of the world depends on various factors such as location, life, age and level of host immunity and genotype of parasite strains (3). Although infection with toxoplasma gondii in humans is very common, however most cases of toxoplasma gondii infections in patients with normal immune system are asymptomatic and therefore do not require treatment. Occasionally, mild symptoms such as influenza-like symptoms, headache, body aches, and lymphadenopathy which is the most significant manifestation may develop among patient with normal immune system (1). In patients with impaired immune system, toxoplasmosis most often occurs among those with defects of T-cell–mediated immunity, such as patients with acquired immunodeficiency syndrome AIDS or those with hematologic malignancies and solid organ transplants especially heart transplant patients. A small but significant percentage of these patients eventually develop severe clinical manifestations of toxoplasmosis including encephalitis, retinochoroiditis, sepsis syndrome/shock, myocarditis, polymyositis, or hepatitis which are very rare in immunocompetent patients (4-10). Although toxoplasmosis may be infrequent among renal transplant recipients, the morbidity and mortality of this complication is high and it can be presented as a life threatening disease (5, 6, 8-10). The aim of the study was to evaluate the value of screening for toxoplasma antibody titers in the donors and recipients candidate for renal transplantation in Ahvaz city, Iran. In a cross sectional study, we studied 52 candidate for renal allograft recipients and living donors who referred to our kidney transplant center before transplantation from March 2010 to April 2012. A standardized questionnaire was used to collect socio demographic data (for donors and recipients), cause of ESRD, date of onset of renal replacement therapy (RRT), kind of RRT and length of time receiving RRT. Blood samples were taken from recipients and donors for check of IgG and IgM anti Toxoplasma antibodies. The levels of antibodies were determined using sensitive enzyme-linked immunosorbent assay (ELISA) method (5). All patients and donors were also screened for, HBsAg, and hepatitis C antibody (anti-HCV) by using ELISA method. All samples were also tested for liver function tests including alanine aminotransferase (ALT) and aspartate aminotransferase (AST) levels by a colorimetric method. Colorimetry is a technique used to determine the concentration of colored compounds in solution (7). The medical laboratories were performed to the patients free of cost by the hospital. All data were collected in accordance with Ahvaz Jundishapour University of Medical Sciences Ethical Committee Acts. At the end of the work, statistical analyses were carried out by use of statistical package for social sciences (SPSS) version 15 software. For statistical analysis, prevalence rates and 95% confidence intervals (CI 95%) were calculated. Chi-square tests were performed to evaluate the distribution of variables and characteristics associated with Toxoplasmosis infection. Statistical significance was assessed at the 0.05 probability level in all analyses. In overall, 52 people who referred to our kidney transplant center were enrolled for this study. 30 people were donors, 20 male (66.66%) and 10 female (33.33%), and 22 people were recipients, 12 male (54.54%) and 10 female (45.45%). As it shown in table (1), Mean age of donors and recipients were 30.32 ± 6.75 years and 45.09 ± 10.57 years respectively. Minimum age in recipients was 19 and maximum was 66 years a. In donors minimum age was 20 and maximum was 60 years. Although the prevalence of Toxoplasmosis infection was higher in donors, there was no statistically significant difference between them (P = 0 .057) and between males and females (P = 0.74). Liver Function tests (SGOT and SGPT) were at normal range in both recipients and donors. It was in donors 25 ± 5 and 23 ± 7 and in recipients 28 ± 8 and 26 ± 5 respectively. Markers of HBV infection were negative in all recipients and donors and HCV antibody was negative in 100% of recipients and donors too. Causes of ESRD of recipients were high blood pressure in eight patients (36.36%), diabetes mellitus in six patients (27.27%), unknown in five patients (22.72%), glomerulonephritis in two patients (9.09%), polycystic kidney disease (PKD) in 1 patient(4.54%) (Table 2). Toxoplasmosis is a well-known opportunistic pathogen among AIDS and immunocompromised patients including solid organ transplant recipients. It can be presented as a life threatening disease with high morbidity and mortality among these patients. Immunosuppressive treatments could reactivate latent tissue cysts and turning solid organ transplant recipients into active toxoplasmosis (11-15). Toxoplasmosis has also been recognized as a potential donor-to-host transmission infection after solid organ transplantation mainly from seropositive heart transplant donors to seronegative recipients, as the myocardium is one of the sites were cysts of toxoplasma gondii are located (16-18). Toxoplasmosis transmitted from the seropositive donor to seronegative recipients has also been described after liver and renal transplantation. However compare to heart transplant patients, it is much more infrequent (16). It has been reported in 57% of heart recipients, 20% of liver recipients and less than 1% in kidney recipients (13). The results of our study show that, the prevalence of toxoplasma IgG antibody and exposure to the infection in adult general population candidate for kidney transplantation in Khuzestan province, Iran, is high and about half of donors (63.33%) and recipients (45.45%) have Toxoplasma IgG antibody before transplantation. The result of our study is similar to the result of Gharavi et al. In a prospective cohort study, they evaluate the IgM and IgG anti-toxoplasma antibody among 102 kidney transplantation recipients in Tehran province, Iran, before and 3 months after transplantation by using ELFA and ELISA techniques. The results of this study show that 63.7% of recipients have Toxoplasma IgG antibody before transplantation. No one of them have Toxoplasma IgM antibody (13). 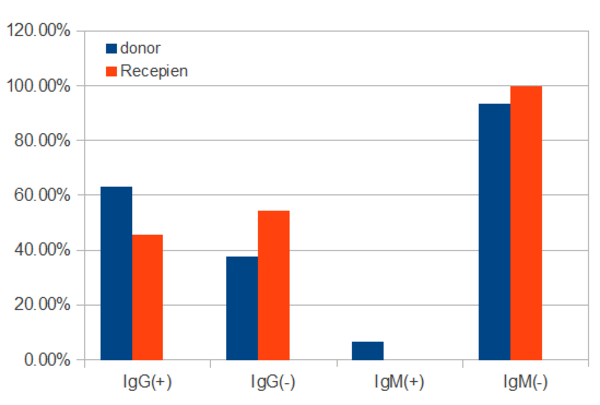 In the other study, Vejdani examined IgM and IgG anti–toxoplasma antibodies in 50 donors and recipients before kidney transplantation in Kermanshah province, Iran and showed that IgG and IgM anti–toxoplasma antibodies are positive among 36% and 2% of the donors and 52% and 2% of the recipients (19). According to the prevalence of toxoplasma antibody in our study and also Vejdani and Gharavi et al studies, and according to the potential reactivation of the disease and transmission of infection from seropositive donors to seronegative recipients after renal transplantation, we suggest that both the recipient and the donor candidate for kidney transplantation should be routinely tested for IgM and IgG anti–toxoplasma antibodies before transplantation to avoid kidney donation from seropositive donor to seronegative recipient and to better follow-up of seropositive recipients for reactivation of latent tissue cysts following immunosuppressive treatments (12-19). This approach is very important especially in countries like us which about half of all the healthy people (donors) and recipients have IgG anti–toxoplasma antibodies in the plasma and therefore if we don’t perform above screening method, some of toxoplasma -negative recipients may be toxoplasma infected from toxoplasma - positive donor (12-19). In our study, we didn’t found any association between seropositivity for toxoplasma antibodies, renal failure and exposure to dialysis. In addition, the prevalence of toxoplasmosis infection was higher in donors compare to recipients in our study. Although it was not statistically significant difference, however the results of our study are different with the results of Aufy et al study (20). Aufy et al classified 78 patients with renal disease who had Toxoplasma gondii antibodies according to the renal status and showed that Toxoplasma IgG and IgM antibodies are positive among 36.8% and 10.5% of renal failure patients not on haemodialysis and 56.7% and 16.7% of patients on regular haemodialysis respectively. In the final of the study, the author suggested that that the more the exposure to dialysis is associated with the more the risk of toxoplasmosis in contrast to our study (20). Toxoplasmosis may be presented as a life threatening disease among patients with impaired immune system such as solid organ transplants recipients. It has also been recognized as a potential donor-to-host transmission infection after solid organ transplantation. Immunosuppressive treatments could also reactivate latent tissue cysts and turning solid organ transplant recipients into active toxoplasmosis. The results of our study show that about half of donors and recipients candidate for kidney transplantation in Khuzestan province, Iran have toxoplasma IgG antibody and exposure to the infection. Therefore we suggest that both the recipient and the donor candidate for kidney transplantation should be routinely tested for IgM and IgG anti–toxoplasma antibodies before transplantation to avoid kidney donation from seropositive donor to seronegative recipient and to better follow-up of seropositive recipients for reactivation of latent tissue cysts following immunosuppressive treatments.